No More Letter of the Week? Fluent letter recognition is one of the (if not THE) predictors of reading success (Adams, 1990). Removing letters from their meaningful context removes the meaning and purpose from the letter. Children who are taught letters in isolation have difficulty placing that information into literacy activities (Wood and McLeMore, 2001). It is more meaningful to introduce letters as they become meaningful to the students. Just because you and I were taught with the LOTW many years ago does not mean it is the BEST way to teach letters. Remember the Virginia Slims saying “We’ve come a long way baby”? Well, we have come a long way in education and current research supports teaching letters in context and not in isolation. Teaching with LOTW slows readers down, yet it’s too fast for others, it doesn’t meet the needs of all learners and there is no room for differentiation. NMLOTW (No More Letter of the Week) teaches the sounds of letters within context of rhymes and motions. Children are selected to be a “Letter Expert” for each letter of the alphabet. The letter expert reads a book from her teacher, which is on her reading level, but contains words with the “special letter.” The letter expert practices the book at home and then reads it to the class. A sentence from the book is then written on pieces of sentence strips and the class works together to put the sentence back together again. The special letter is emphasized while the student teaches everyone about her expert letter. She brings in items beginning with her letter and she also brings in a large letter that is decorated with print and cut-outs from magazines that contain words beginning with the special letter. 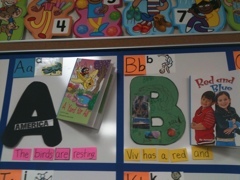 A special bulletin board or wall is set up by the teacher to display each letter. 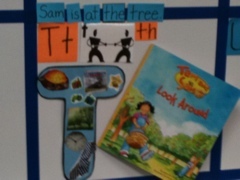 If the wall is at student level, it can be utilized by the children to reread the sentences using pointers. Their book can also be placed in the letter square. This is a great center, as the letter’s continue being added. 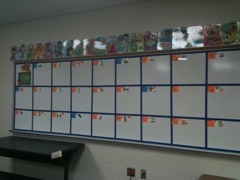 This is the “Reading Wall.” This is the set-up part, before the student use it. I used painters tape on my second white board, to section off the 26 sections (plus 1). 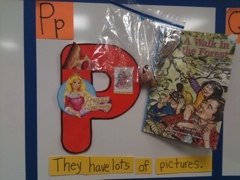 When each letter is introduced in the curriculum, one child will be the “Letter Expert,” and take home a large cut-out letter, an emergent reader book (I use little books from the Pearson Reading Street curriculum). Also, inside of the take home bag is a sentence from the book that contains a word beginning with the letter expert letter. ← What do you miss about being a child? information I was looking for this info for my mission. I am glad that you found what you are looking for! 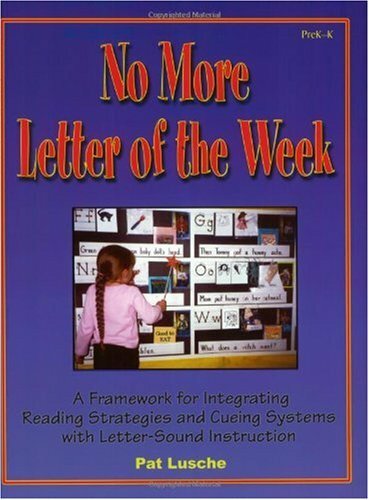 As for where I got my information from….I researched the topic using the program and book “No More Letter of the Week.” I also used the program myself and interviewed other teachers that used it, to get first hand information from them. Thanks for stopping by and for your kind words! I have used “No More Letter of the Week” for many years – I like your photos – about how big are the spaces you use? Are those sticky notes with the words from the sentences – I use cardstock strips and the stickies wouldn’t take as much room! Also, I notice the use of the larger cut-out letters in each square – do students locate and affix pics of items beginning with the letter? Do you use the student’s picture as part of the square? So many questions – I’m always trying to tweak and improve my NMLOTW program! Thank you for your kind words! Yes, I used sticky notes for the upper left hand letters, but not for the sentence. I just cut up cardstock and used ticky-tack-like you. One year, I wrote the sentences on sentence strips, but found that it took up too much room also. On the large cut-out letters, students did affix pictures and items to them. I sent home a large ziploc bag with the student who would be the letter expert for that letter. I sent it home the weekend before I introduced the new letter, the following week (according to our school’s mandated curriculum). The bag had the letter, the book, and the cut-up sentence pieces. Their homework was to glue photo’s, words and/or objects to the letter. One year, I did use the students picture as part of the square. But I found that it is not necessary, as the children knew who the letter expert for each letter was. However, I would forget-so using the pictures was more for me! I hope this helped. Don’t hesitate to ask anything else! Have a super star school year! My daughter’s school uses this program and we will be starting in fall; however, I am unsure of how to actually implement the program….how/when do you introduce each new letter? Is it one every day or ????? Hello-If you can get your hands on the book “No More Letter of the Week,” it explains everything step-by-step. I like introducing 1 letter a week, however due to our school’s Curriculum schedule, I had to introduce 2 letters a week several times. My spouse and I absolutely love your blog and find the majority of your post’s to be exactly what I’m looking for. I wouldn’t mind composing a post or elaborating on some of the subjects you write concerning here. Again, awesome website! I recently came across your blog again have been reading along. have enjoyed reading. Nice blog, I will keep visiting this blog very often. I have also added a sign language card for each letter! I am switching to NLOTW this year…..I do not have the wall space for it. Do you know of any alternatives? Thanks! I would recommend making a class book. Or, you could use a file folder to represent each letter. I’m trying to gather the books for each letter to use with NMLOTW and I’m having a hard time locating all of them. Do you have any suggestions where I can buy the different books at? thanks. I have just discovered NOLW and I’m so excited! I’m preparing to use it in my preschool classroom. But I don’t like the sound pictures provided in the book. I love the idea and I’m fine with what is in the picture but I don’t love the style of the picture. Are there any other pictures out there? I have been looking and looking and can’t find anything! And I cannot draw! There are tons of free clipart options on http://www.teacherspayteachers.com !!!! Birthday Party Fun – Teacher/Mom Style! Spring has Sprung in Kindergarten!! Just for Kids-fun Websites, Games & Apps! Just for Teachers - Current Teaching Practice Links!